Blue Pine spray deodorant, with a special bar diffuser, specific for bathrooms and areas with particularly stagnant air. This product is also available in "lavender, menthol and thyme". After shaking the can thoroughly, press the distributor nozzle, or pull down the bar, and spray upwards for a few seconds. Spray the product for no more that 4-6 seconds in normal environments. DO NOT exceed the indicated quantities in order to prevent accumulations of flammable gas. It is also possible to hang the can on the wall or on any smooth, clean and dry surface after removing the protection from the adhesive support. 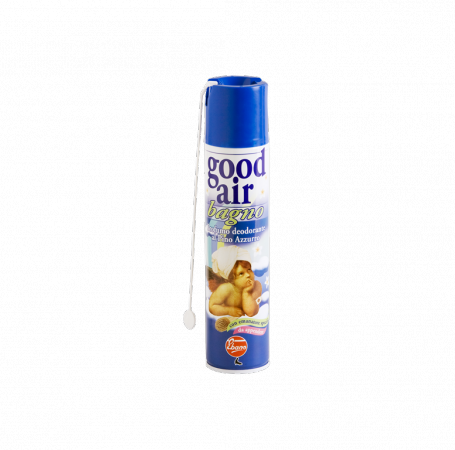 The absence of water makes this deodorant dry and therefore particularly resistant in the air. Suitable for bathrooms and in all closed spaces where air stagnates.